Perhaps the greatest singular book of importance in the entire word of God is Paul’s writing to the Romans. I assume you believe, and hold dear that God’s oracle to man, called the holy scriptures, are the only record from heaven to man, whereby we may know and act upon what God has uttered. Romans, that masterpiece of logic and truth, which silences the adversary, and glorifies God, is what we have before us. Romans, a book breathed through the very spirit of God, to and through that singular apostle of grace. Paul the teacher, prophet, true pastor, and evangelist, comes on the scene with clarity and power, demonstrating, explaining, and proving, that the gospel in all its glory, as seen in the work of the Lord Jesus Christ, is God’s wisdom in the midst of a crooked and perverse generation. The word of the Lord Jesus was, ‘I have many things to say unto you,’ and his unfolding of truth through Paul is one of those many things. So we believe the words of Paul are the very words of the Lord Jesus, and we can see the tender hand of God, as he exhorts his own people with the hope of glorifying God. And this dear friend, is the most important theme of Romans, for yes, while it is a blessing to be brought from darkness to light, it is a greater affair for a sinner to now give glory to God. Paul will prove that mans deeds are set aside, and his very mouth is stopped, for the apostle defends the court of heaven by stating man has no good to speak of, while he unfolds this wonderful truth and doctrine of the righteousness of God. So above all, Romans is a book of sound doctrine, and many a man has been slain by the arguments of the apostle. Paul proves the importance of rightly dividing the word of truth, and holding securely to Paul’s doctrine, will save a soul from a multitude of poor teachings. So the epistle begins: Paul a servant of Jesus Christ. This statement is accentuated by the fact that this man Paul, who was known as Saul of Tarsus, was once an enemy of the gospel of Christ. But this very book serves as a treatise and an example of how the grace of God can convert the very chief of sinners. Saul of Tarsus, according to his own words, was a stellar example of law-keeping. Yes, he was a Jew, a Hebrew, an Israelite, and a Pharisee. He had a pedigree unlike all others. Circumcised the eighth day, of the tribe of Benjamin, named no doubt after Israel’s first king Saul. If any man could boast of law-keeping, it was this man. As a disciple of that learned elder Gamaliel, Saul was the finest example of how a person walked according to the righteousness which was in the law, in fact, he was blameless. 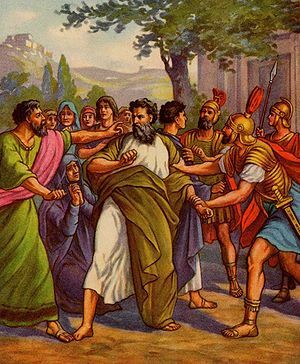 It was Saul of Tarsus, who stood by when the man of God Stephen was being stoned to death. Yes, Saul agreed, this man was meshumed, traitor to the true God of Israel, and such as he are not deserving to live. Saul of Tarsus would have also agreed that the Pharisees interpreted the law correctly when they dragged the adulterous woman to the presence of the Lord Jesus, and sought her death as well. Lawbreaking according to Saul, could not be done by any soul desiring to please God. Saul was taught that to break the law, one could not be a servant. But reader, Saul would be taught by the Lord in heaven, that yes, the law was given through Moses, BUT, grace and truth came by Jesus Christ. It is the grace of God that came upon Saul of Tarsus, he was converted to the true God of heaven, as he sat in his glorious blindness pondering the wrath of the law, and the freedom and majesty of the grace of God. Paul, content to consider himself a servant, tells us he was called to be an apostle. You will understand that countless thousands hate the fact that Saul of Tarsus, a Jew, an Israelite, and a Hebrew, spoke with power as he testified of the Jewish Messiah. But is not this the foolishness of God? The world of Saul of Tarsus came to a screeching halt that afternoon, for he heard the Lord of creation speak, and not only did he hear words, but he heard words spoken TO him. And not mere words to deliver a message, but the word of God spoken to his own heart, mind, and conscience. Saul received an answer as to who the voice was, it was the Lord Jesus, the very one in whom he counted as a mere evil influence upon so many. But an influence? Surely not, but the Lord of all glory, and because of the blinding presence of the glory of God, Saul could not see, and he would explain later, that he could not see for the glory of that light. This blindness was not punitive! What words from heaven, what a charge to a man who was a blasphemer and a persecutor. Is it any wonder that certain disciples doubted as to the conversion of this man? God would make Saul of Tarsus a minister and a witness? He would make him an apostle, a teacher of the Gentiles, a pastor to the people of God? Yes, the grace of God is seen in the most unlikely places, and the heart of Saul of Tarsus was the most unlikely of places. So this man is found in the city, being obedient to the heavenly call, and sits for three days, without bread or water, as he muses on the law, the prophets, the psalms, and the wonderful transformation upon him by the grace of God. Paul would write later, that he was a pattern to all sinners, and he would unfold in the very book of Romans; that forgiveness of sins and a place among the redeemed could only come by faith in the Lord Jesus Christ. Paul would go to his grave defending salvation by grace through faith, as this was the first word he learned by the Lord of glory. Thus, God now calls him to write to the Romans, and to us, to further teach the wonders of the glorious gospel. Not now Saul, but Paul the apostle, one called so by God to speak forth the praises of the grace of God. Paul would state first he is a servant, and in this simple word, we see the large heart given to this man of God. Yes, an apostle, but first a servant, a servant with a purpose, separated unto the gospel of God. Paul would tell us that the gospel concerns the son of God, for the holy scriptures said he, wrote of him. Paul’s first defense was not only in stating that the Lord was the Messiah, but that the Messiah was in fact the son of the living God. And this was done through the spirit of God through the scriptures. But not only the scriptures, but the holy scriptures. Words from a holy God, directed through the Holy Spirit, to Paul, that he might explain the holiness of God. What a man of God Paul would become, as he learned the reality that all who live godly in Christ Jesus shall suffer persecution. Thanks – and thanks also for following my blog, Learning From God’s Word. God bless you and make you a blessing to many. It’s all good Charlie, God’s word satisfies. Romans is truly the ‘declaration of independence.’ Independent of God, man is nothing. Yes we are in agreement about Paul but he also confirmed Signs and Wonders, Faith without works is dead, these are not man’s works but God’s that are empowered by The Holy Spirit. What is your real name please, I don’t like talking to a Blog name, it’s unfriendly, if we are going to share heart to heart as a Christian Brother and Sister in Christ Jesus, than it needs to be open communication and yes we are to resolve our differences as God tells us to and not just agree to disagree or argue, both cause division which Paul warned against but not many listened as we can see with all the different Denominations etc The Holy Spirit does not say one thing to one person and something different to another when it contradicts, yes He may share something with you that you can share with me or I with you but it will always be confirmed in Scripture. I am not an Ordained Preacher, that is not a woman’s role it is disobedience, my role is a Helpmate but like Deborah and Paul to name a few, I share God’s Truth, I’m under His Authority and I have His wisdom and The Holy Spirits empowering, having asked for them and received them (see below) I was not born with either, have you asked for God’s wisdom and empowering ? James 1:5-7 If any of you lack wisdom, let him ask of God, that giveth to all men liberally, and upbraideth not; and it shall be given him. But let him ask in faith, nothing wavering. For he that wavereth is like a wave of the sea driven with the wind and tossed. For let not that man think that he shall receive any thing of the Lord. A double minded man is unstable in all his ways. Colossians 2:2-3 That their hearts might be comforted, being knit together in Love, and unto all riches of the full assurance of understanding, to the acknowledgement of the mystery of God, and of the Father, and of Christ; In whom are hid all the treasures of wisdom and knowledge. Luke 11:13 …. how much more shall your Heavenly Father give the Holy Spirit to them that ask Him? That could not possibly be true, as “his superiors” were the Sanhedrin, of Jerusalem, the jurisdiction of which ended short of Galilee, and most certainly did not extend to Damascus, Syria, another country entirely. You really don’t do much thinking when you write these things, do you? You do get credit arch for trying to chisel away the truth of God, but surely your arms must be getting weary………..
As if a thief asks for permission to ransack the contents of a home.